Price tag on the back cover. Exclusive! First peek at the 26 deadliest new warbirds to prowl the Skies! Danger! Will the New 360 degree turret bring an end to heroic dogfighting? Dirty Deals! Details on the controversial GM Intrepid! 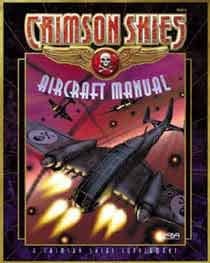 The Crimson Skies Aircraft Manual provides descriptions, game statistics and rules for the newest selection of planes in Crimson Skies. It also provides a first look at the air forces of the Atlantic Coalition, Columbia, Maritime Provinces, Pacifica and Utah.